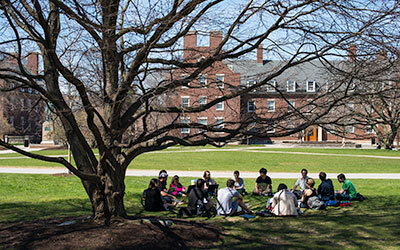 The Literary Arts Programs at the University of Rochester support a vibrant literary community on campus, promote world literature, and foster the art of imaginative writing. We have programs in creative writing and literary translation, as well as community service opportunities, public readings, lectures, and informal gatherings. The university is home to Open Letter Books, one of the country’s leading publishers of literary fiction in translation. The press gives undergraduate and graduate students the chance to combine intensive literary and language studies with hands-on experience in translating, writing, book reviewing and production. In addition to our rigorous curricular offerings, the University of Rochester boasts one of the most prestigious reading series in the country, the Plutzik Reading Series, and a vibrant student-run arts and literature journal, LOGOS. The Reading the World Conversation Series, launched in the spring of 2008, brings international authors and translators to Rochester to speak about their craft. For those with an interest in community service, The Inspiration Project runs in collaboration with the local organization CP Rochester. In weekly meetings every spring semester, University of Rochester students work with adults with special needs to produce a creative anthology of fiction, memoirs, and poetry. The Writers Lounge, a reflection of Rochester's tight-knit community, is a weekly gathering of student writers, who come together in the Humanities Center to chat, snack, write, and translate together. And finally, to celebrate the rich tradition of American creative expression, The Susan B. Anthony Institute and the Department of English award the Janet Heidinger Kafka Prize annually for a work of fiction by an American woman. The Literary Arts Programs are affiliated with the Humanities Center.